Current regulations allow owners of AK charter vessels and CHPs to fish subsistence halibut with direct family, but not friends and neighbors who also possess valid SHARC cards. The ACA has proposed to the Alaska Board of Fish that we address this issue and allow people with subsistence rights in Alaska to fish on the vessel of their choice. Nobody has an objection to this idea, but there are discrepancies between federal and state law on how this can be remedied. Here's the request we sent to the BOF. If halibut harvested using sport fishing guide services is possessed with halibut not using sport fishing guide services on Convention waters in Area 2C or 3A, the following Federal or IPHC annual management measures for guided sport fishing for the area that the halibut was harvested apply to all halibut onboard the fishing vessel: carcass retention requirements, daily bag and possession limits, and size limits (if applicable). More info at the NPFMC website. If a CHP is not registered with NMFS, the CHP would not be valid for use during the applicable fishing year. Option 1. CHP ownership (e.g., ownership holdings for the CHP by individual(s), partners, or a corporate entity). Ask: Did you receive financial compensation for use of a CHP in the preceding year? Discussion at the NPFMC website. Full ACA members receive a link on the ACA website to their charter business' website. 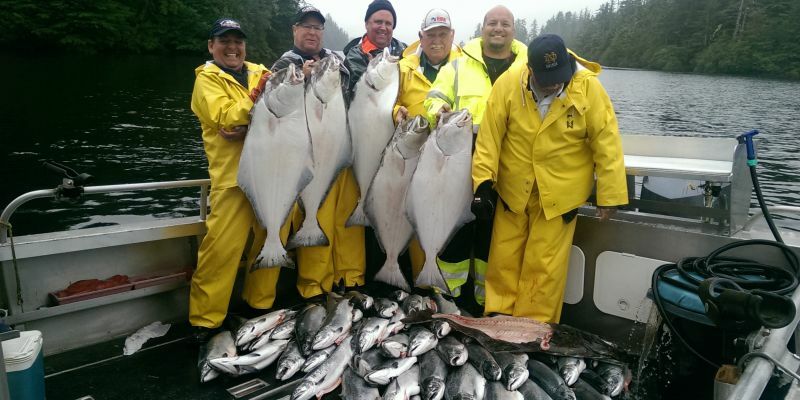 Potential clients like to see their charter captains engaged in conservation and the management process to defend the rights of recreational fishermen in Alaska. We're in the process of updating this page of members and their websites, so if you've neglected to renew, please do so now and we won't have to drop you from sight! NOAA Fisheries sent charter operators a survey in the mail for an analysis on Recreational Charter Fishing and the economy. This is important! The data can be used to strengthen our hand in many management decisions. Make sure you mail your reply by April 30th. The troopers will be hosting a joint regulation and enforcement meeting at Alaska Islands and Oceans visitors Center in Homer at 6pm on Thursday, April 26th. This will be an excellent opportunity for Charter Skippers and any other interested parties to get informed and ask questions about regulatory changes and issues. There will be representatives from NOAA OLE, ADFG Sport Fish, and AST attending. They will also be introducing a new outreach project regarding Deep Water Release of rockfish and will have a few different types of release devices available that they'd like to distribute to interested members of the Homer charter fleet. The National Saltwater Recreational Fisheries Summit held its third meeting since 2010, which brings the leaders of the recreational fishing community, equipment manufacturers, and government policy makers together to share and find solutions to problems facing the recreational fishery. ACA president, Richard Yamada, worked on the Summit steering committee and participated on a panel focused on Innovative Management Alternatives. He presented on the Recreational Quota Entity, recently adopted by the North Pacific Fisheries Management Council. His presentation can be found here. A Summit highlight was the visit by the Secretary of Commerce, Wilbur Ross, who in his speech referred to a recent economic report that showed how significant the recreational fishing sector was to our nation's economy. His visit, which is rarely seen at events such as this, demonstrated his support and commitment to a strong recreational fishing sector moving forward into the future. A report on the Summit will be forthcoming and ACA will provide a link to the report when it becomes available. A brief description of topics discussed may be found here.